Hyundai has launched its new range of hybrid and electric vehicles at the Geneva Motor Show 2016. The Ioniq will rival the Toyota Prius on price and be available in hybrid, plug-in hybrid and pure electric forms. Expect to pay from around £20,000 when it arrives in showrooms in late 2016. 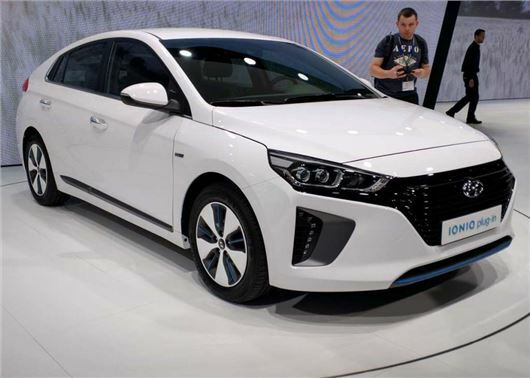 The Ioniq Hybrid uses Hyundai's new 105PS Kappa 1.6 GDI petrol engine, linked to a six-speed dual clutch transmission. An electric motor will deliver an additional 43PS and be powered by a battery located under the seats. There are no details on fuel economy, but CO2 emissions will be as low as 79g/km. The plug-in hybrid variant uses the same powertrain but with a larger battery that can be charged from the mains, giving a 31 mile range and lowering the projected emissions figure to 32g/km – but as with all plug-in hybrids the emissions and fuel economy will depend on how often the car is charged and how far the owner typically drives day-to-day. All-electric models boast a 155 mile range, with the electric motor producing 120PS. However, Hyundai hasn't said how long the battery will take to charge or if it will be included in the price of the car or part of a leasing deal. Inside, the Ioniq gets plenty of modern technology including TomTom navigation, Android Auto and Apple Car Play connectivity, and a seven-inch touchscreen system. There’s also a full complement of safety technology including blind spot assistance, adaptive cruise control and lane keep assistance.